Chappal ithe soda aani ya line madhe ubhe raha. I do as the policeman directs. 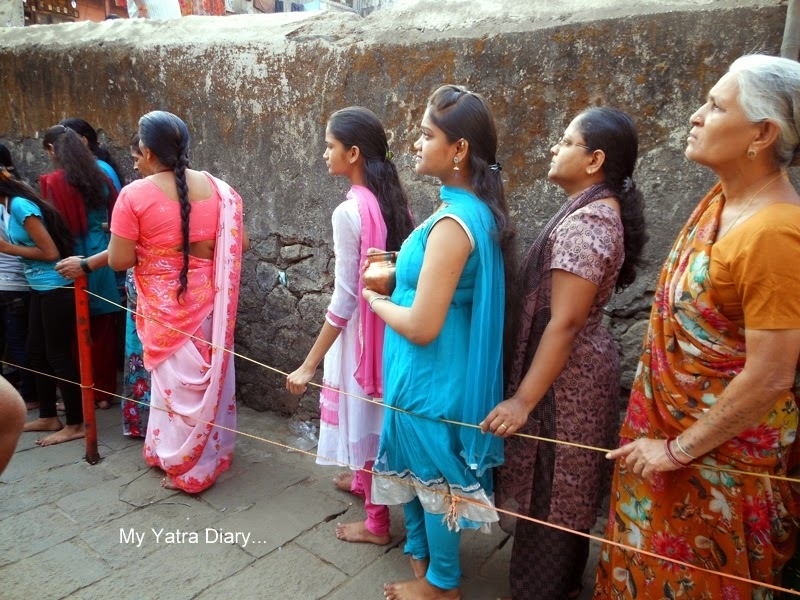 A few paces into the queue, barefoot and more abandonment follows. The fast lanes drift behind and the light of the day fades away. With this begins my journey into a world historic, deep and different. 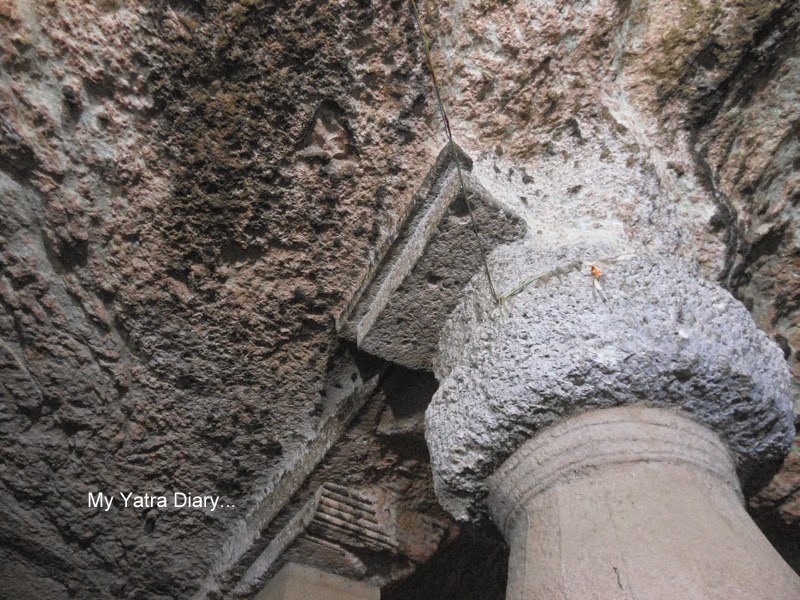 Sitting in the heart of Jogeshwari (E), the western suburbs of Mumbai, the Jogeshwari Shiva caves are a world unto itself. Dating back to the 6th century, the caves are so ancient that they can easily give an antiquity complex to its more profound siblings - the Ajanta and Ellora caves of Maharashtra. Surrounded by dilapidated structures and nondescript shanties, the caves neatly tuck themselves in from the hurly burly bondages of life, a place where the outside world ceases to matter. Moving past the shanties towards the cave, I can't help but see the metaphor: aren't these shanties like the state of lives we are living today? ...sturdy outside, somehow holding onto the ground yet fragile, weak and decrepit inside. But, there is always a way, and we shall arrive only if we are willing to move in the right direction. 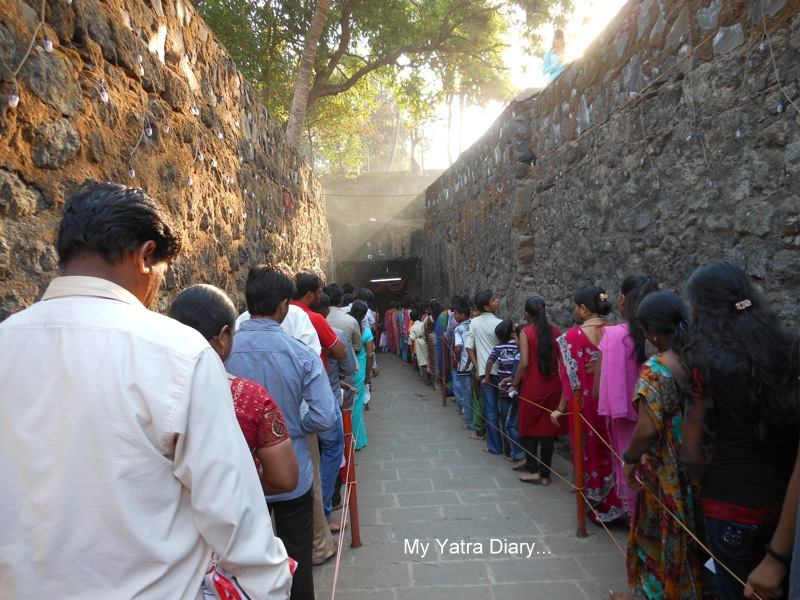 With the faithful: Walking in the queue towards the caves. My way is strewn with lessons of tremendous patience and unwavering faith as I make tiny strides along with hundreds of others standing in the queue. It's the big day of Shravan Monday (July-August) and a special day (His personal favorite!) 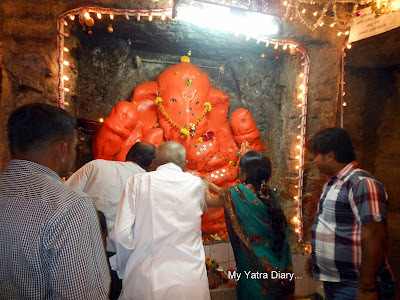 to receive His blessings, and I am looking forward to visit the comforting realms of His house – the Jogeshwari caves - trying my best bit to catch all the action – of doodh (milk), bilva patra (sacred leaves of bel), phool (flowers), mantras (chants) and people. Needless to say, I get it all – in abundance. Everyone is eager to meet the Lord! A few more paces and soon, the decrepit structures vanish in the distance giving way to the gleaming entrance of the cave illuminated by the filtering rays of the early morning sun. I climb down a flight of stairs and darkness greets me into the courtyard of the cave. It is only 7.00 in the morning but I realize I’m already late. A daunting swarm of people are flocking everywhere my eyes can see. Along with a deep sigh, my heart lets out a silent cry of 'Om Namah Shivay' and I gear myself up to mingle with the pilgrim crowd. Om Namah Shivay! First glimpse after stepping foot inside the cave. 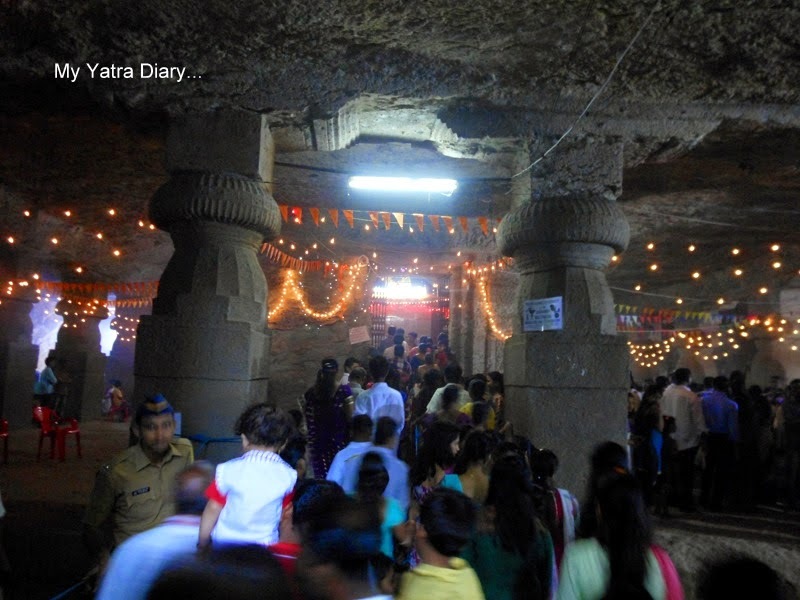 The cave houses a number of Gods and Goddesses within its precincts – the Jogeshwari Mata, the Jogeshwar Mahadeo and the Ganesh temple among others. 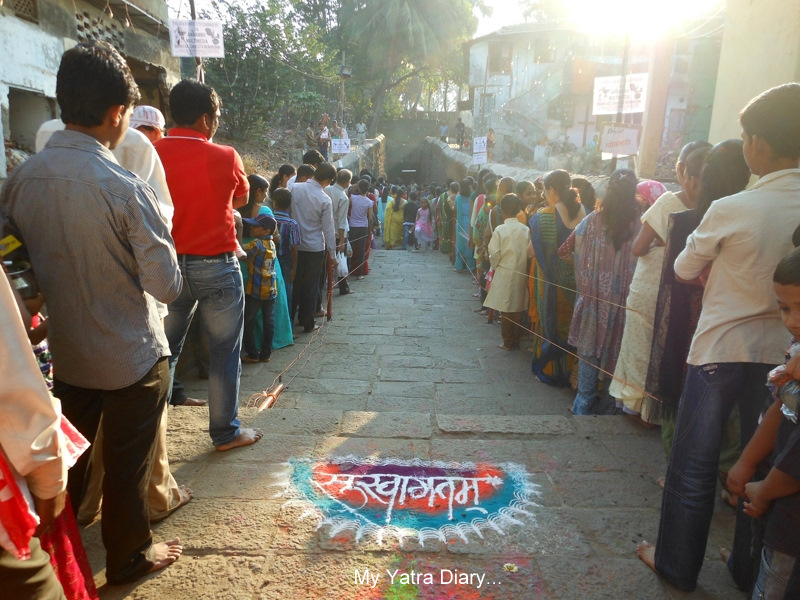 The first among them to make an appearance is the temple of Jogeshwari Mata right across the entrance. 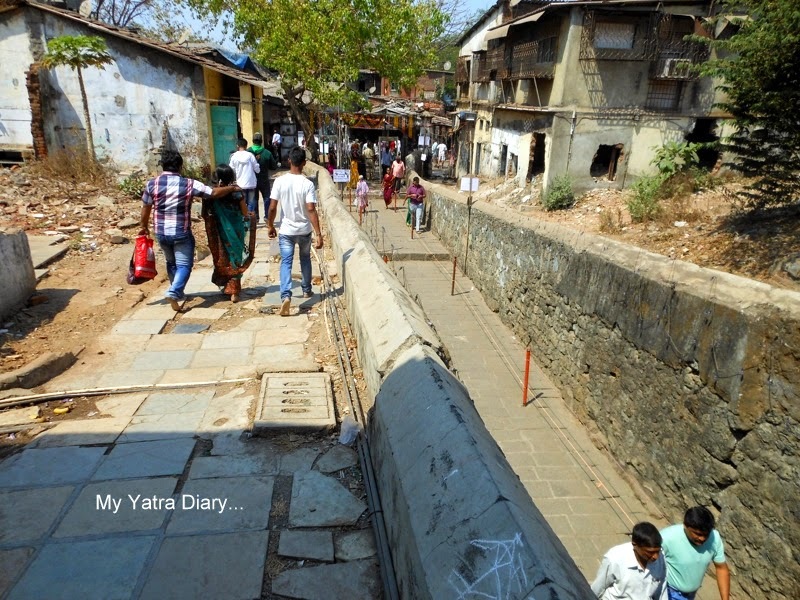 Here, one can see Her footprints and an image that is a form of Shakti, and is venerated as the local deity of the locality, the Kuldevi after which the area gets its name. This temple has two ganas or guardians of Lord Shiva carved in the rock and seated at the entrance to protect the Goddess. Let's pay our respects to Jogeshwar Mata far in the distance. The security guard of the mata: In stone. I thank mother for calling me here before proceeding further. The serpentine queues are huge and many in number. People from all walks of life gender, status and age no bar – are all standing as one with a single pursuit - to meet the Lord. The numbers are overwhelming but as I walk and weave with them, the feeling I get is far from exhausted. On the other hand, it’s that of wonder and stimulation, of oneness and belonging, of spiritual renewal and of positive spark of finding the hidden wisdom that resides within each one of us. The Power of One: In faith and belief! An epitome of purity and divinity. What do you say? The room is never overly noisy but is filled with a constant hum of hushed chants and pulsating murmers. Most of the people keep to themselves, silent and introspecting, perhaps keeping in accordance to the meditative ways of Lord Shiva. With them, they carry a lota (brass vessel), filed with either water or milk, and clutch it secure so as to not spill a single drop outside. The lota somehow ceases to be a mere utensil today. It is much more significant reflecting a sincere prayer, a resurrection of faith and a quest – to seek His divine grace and ask for sincere repentance. The sacred treasure: The lota which holds the jal for the Lord. The interiors of the cave are not in a good condition with most the stones torn off at various places exposing different shades of whites, grey and black. You can’t help but feel sad for the neglect its borne for it's a national heritage. 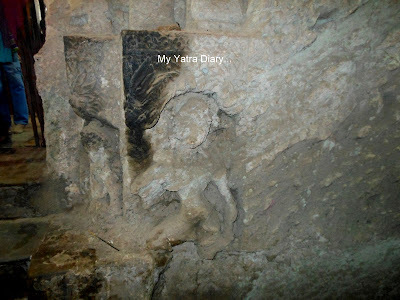 I roll my hands over the stone slabs and rocks protruding out of the cave walls and marvel at them from time to time. It’s earthy and unsophisticated textures are convincing enough of His humble existence inside. Wear and tear: But no one to take care, restore or repair? Time ticks by... it's already about 3 hours of treading in the caves. Finally, a ray of light appears at the end of the deep tunnel, a ray of hope bringing with itself an anticipated surcharge of energy in the devotees. The air is now thick with eagerness; the woman ahead of me jumps into action getting her lota ready with milk and a few colorful flowers. Lord Shiva is now only a few steps away. 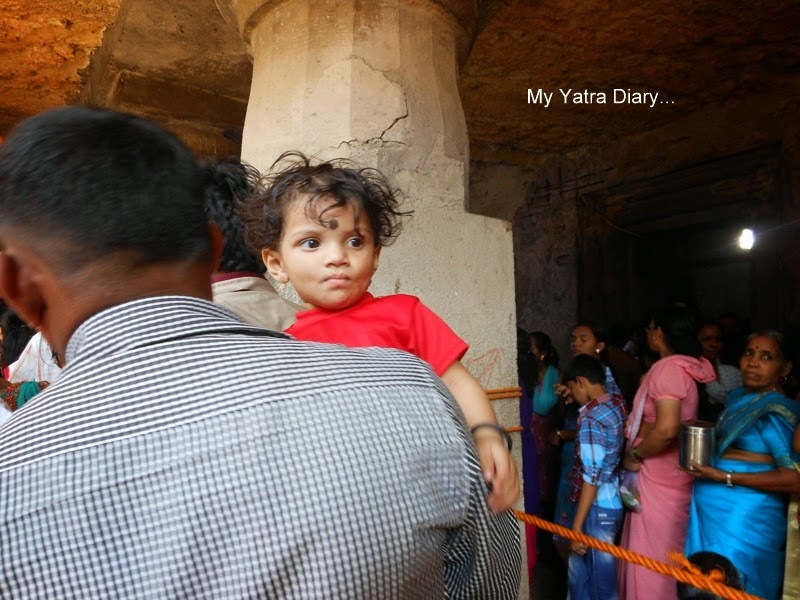 At the Jogeshwar Mahadeo temple, a huge bell hangs at the entrance. Below, the Nandi bull, the vehicle of Lord Shiva sits guard while pictures of lord Shiva in various forms hangs at the side walls. Inside the sanctum is the shivling - a black colored stone characterizing the three eyed Lord of the universe – Lord Shiva. Above the shivling, hangs a dhanetra from which milk drips bit by bit onto the ling. Devotees offer milk, flowers and bilva leaves and pray for peace and prosperity. The moments are few but they are prized and precious. These are moments of peace and fulfillment; moments of connectedness with the Divine… with one’s own self. I kneel down, clasp my hands and close my eyes. I’m in front of Him. On the way out, I come across a courtyard housing an exhibition of colorful rangolis and ancient carved relics of ganas or guards of the temple. A little further is the temple of Lord Ganesha, the son of Lord Shiva. The Ganpati temple leads me to the exit. I ascend a fleet of stairs and I find the tranquility of the caves loosing away within the chatter of the outside world. Stepping back feels like a rebirth where the enveloping womb of the mystical caves has given way to the harsher realities of life. And, here is where the real journey begins, of identifying the real self in this mirage of the world. But He shall guide, as He's the father - benevolent and compassionate. .. it shall be with a difference. 1. From the Jogeshwari station (Western Railway Line / East) to the temple caves: Hire a rickshaw for minimal fare or walk the 3 km distance on foot, it's not really far. Ask for directions, the locals know the place well. 2. 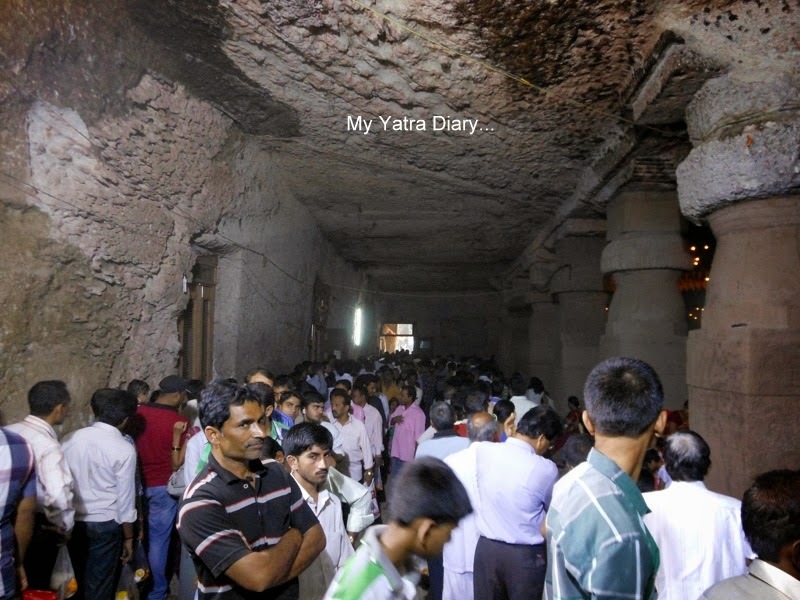 There are no shops inside the cave.If you are visiting during the festival times, the queues can be really large, so be prepared. Carry some water from home. 3. Best time to visit the place: Shravan Monsoons (June - September) or Shivratri (February) to catch the festively divine atmosphere. Preferably early mornings if you wish to avoid the crowds. What a lovely description. I had no idea such a place existed in our bustling city. How awesome of you to stand in this long line so early in the morning! I am sure He blessed you enough to make the wait worthy! My goodness what a wonderful experience and one I'm honoured to have experienced through your blog. WOW, this is sure stop on my next visit to Mumbai. Have you been to Ganpati temple in Borivali west? The idol is in a big rock and it appeared in that form many many years ago. 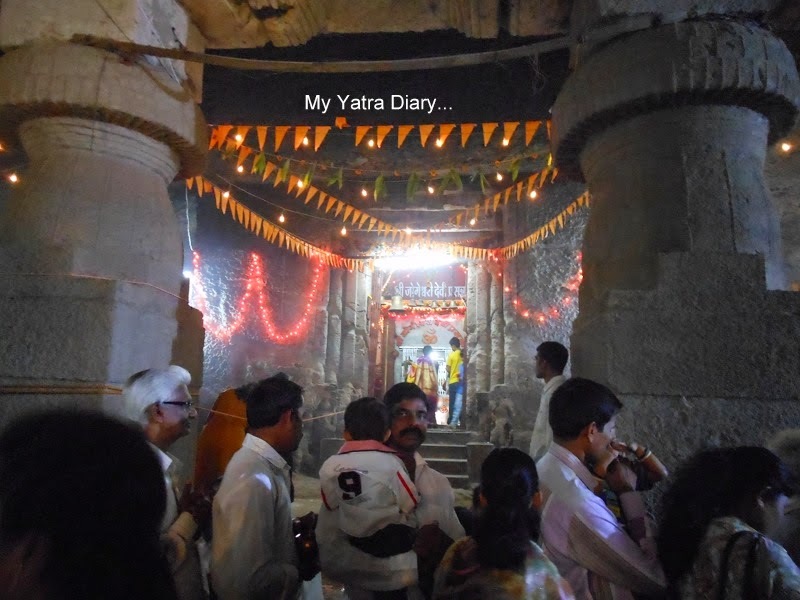 What a journey - into the mysterious caves and the mysteries of faith, hope and devotion - and ou into the sunlight again, harbouring treasures from inside ... love your writing Arti - it brings poetry into travel! Hope you have a blissful week! 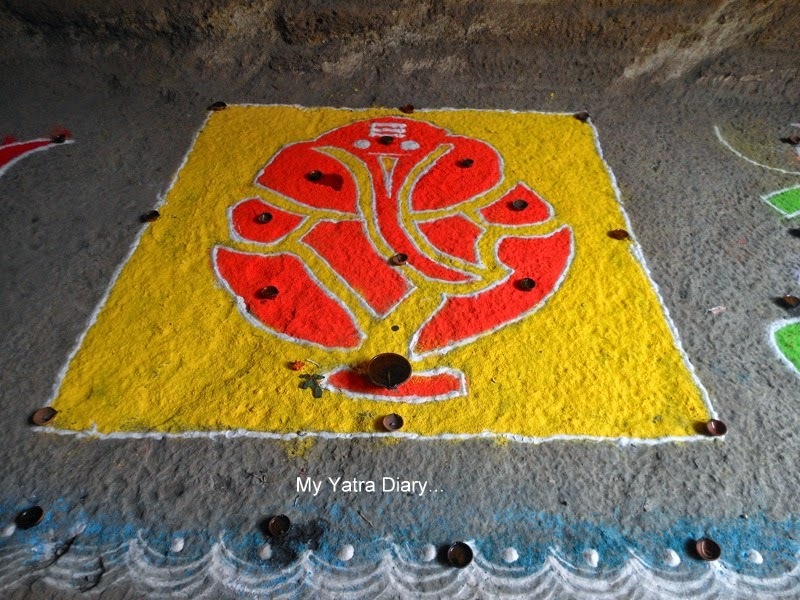 I learn so much about your spiritual tradition when you write of the festivals, Arti. Though there was a crowd in the cave, all seem calm and patient. I was in an underground cavern in Arizona this spring. It was open to the public but very controlled. A guide brought small groups of us into the cavern and walked us thorough on specially designated paths. A fine mist showered us briefly before entering so lint from our clothing and any body cells would be encouraged to stick to our bodies and not fall in the cave. We were told not to touch the walls of the cave and were forbidden to take photos. The inside of the cavern was sealed from the outside and was climate-controlled. 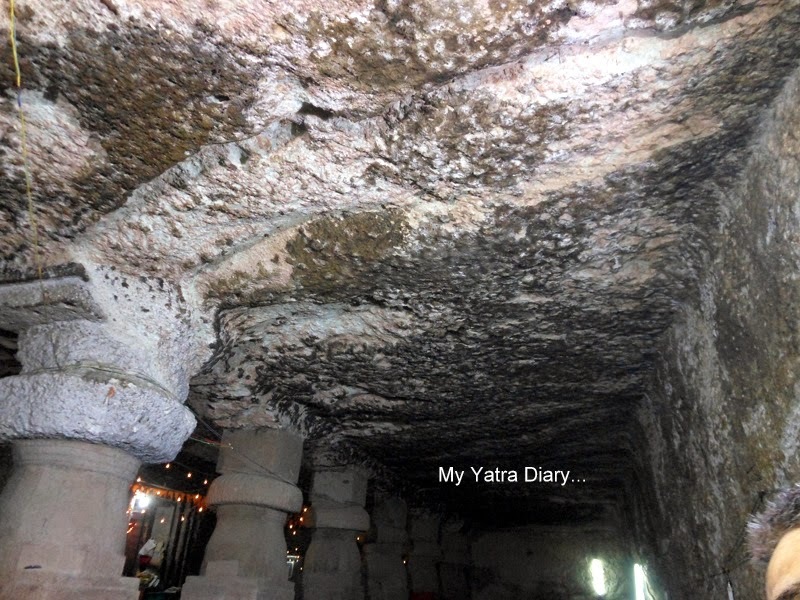 I hope the Shiva Cave which has already survived for so long, will be safeguarded for future generations. 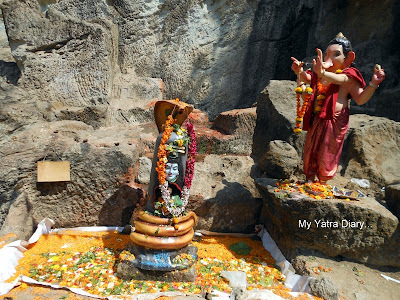 I did not know about these caves, Arti even after staying in Mumbai for sometime! Maybe next time will plan a visit! I started reading the post, but then I found myself in the queue. I also had Lord Shiva's favourite flowers Gokarna with me and Bilva patra too. I am feeling, this journey should never end or the end can be when the 'Me' or the Aham completely melts in Shiva and Shakti. 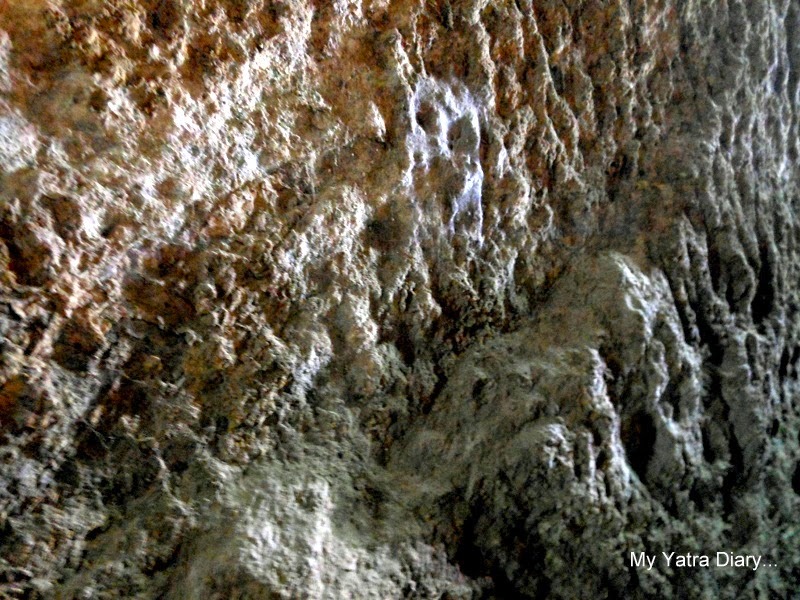 The oldest Yogi on the earth Lord Shiva meditates in these caves. Our country is so divine because of such places. 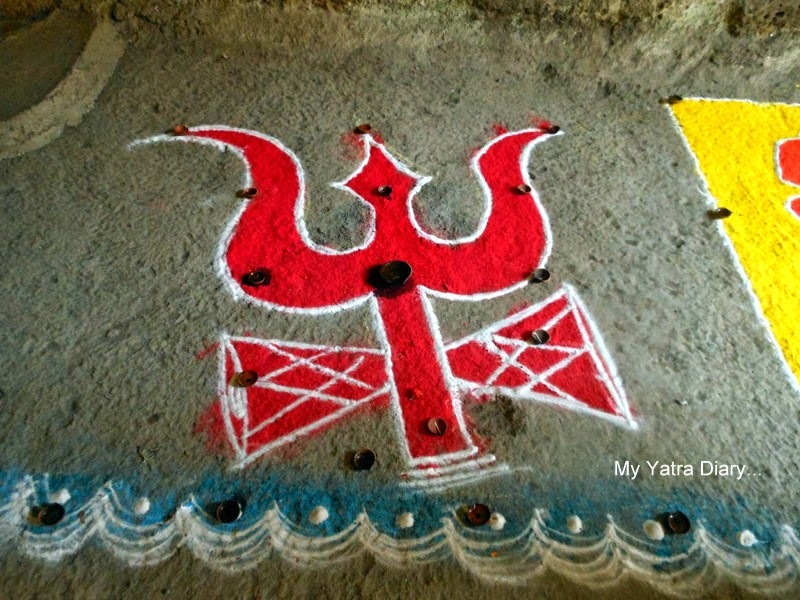 Thanks to you Arti, by this modern means of blogging I could reach to Lord Shiva and perform the ManasPuja. :) This is very special for me, because this year I missed to go to Shiva temple due to crowd. Must have been a wonderful experience Arti.. 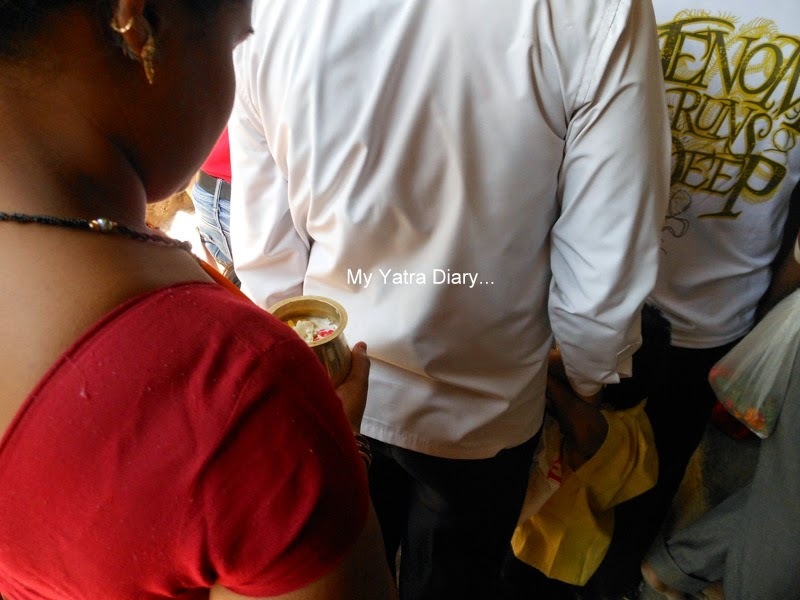 Experiencing the ironies of life, state of living and eventually meeting the maker who knows all will be treated equal once the end is near.. All through this while, we must admit the patience the devotees have waiting for hours! Great pics and even better captions Arti..
Love your charming descriptions and exquisite use of words. Makes the narrative compelling .The pictures are fascinating and by reading your post one gets a virtual walking tour of the caves. Sad that the rocks are weathering and weakening. Government/ASI must take immediate steps to prevent further deterioration.Thanks for sharing your magical,mystical and incredible divine journey to Jogeswari caves.Hope to make it some day. This looks like a wonderful and such a profound experience, Arti. It is amazing how much patience everyone has. What a beautiful virtual tour! 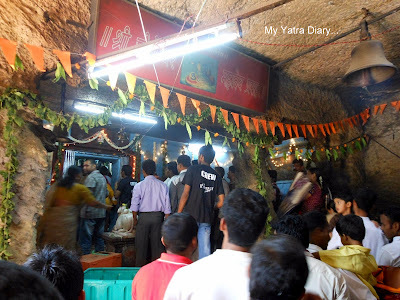 Arti, Great to read your new post on Jogeshwari Shiva Caves. Great description and photos. Thanks for sharing. Wow Arti, I didn't know these caves existed, having lived most of my life in Mumbai, so thank you for enlightening us. The photographs are vibrant, the description leads us through the caves ourselves. Excellent! Place looks quite busy, pictures are lovely and cave looks interesting. Whoa that's a lot of people but it looks like a disciplined crowd. I can almost hear the chants in some pics. Great tour of the temple. They sure are a world unto itself! Great place...long queue! It must be all worthwhile once you reach at the feet of Mata, right! Getting into a big cave separated from outer world would make me feel like I was in a different world. I see festively divine atmosphere in the women beautifully dressed up, holding lota with them. I feel people's prayers and energies to be sent out to us readers through your writing. Thank you for sharing another holy festival, Arti. Even Lord Shiva himself would be proud of this post! Superbly written! Such a beauty hidden in Mumbai! You’ve got the real nomad in you. And it’s envious besides. No wonder that you’ve bagged so much of flowers (Feathers). Indeed we’re lured by your travelogues with such regional scents. 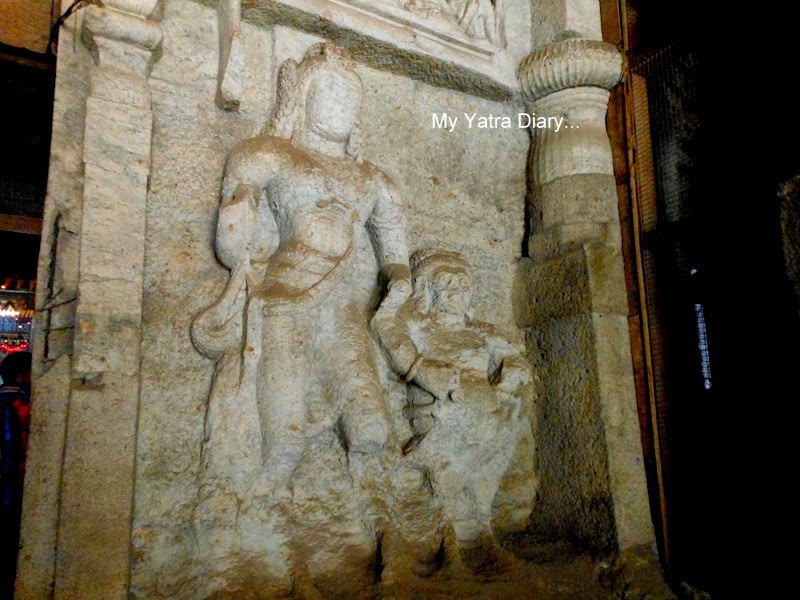 Are the Ramgarh Caves in Shankarwadi and Jogeswari Caves the same ? I am afraid I have no idea about that, Tirtha.